Steady improvements in house design will reduce the energy running costs. E.g. Smart building energy management systems and more efficient appliances. Roof tiles can now be substituded with hardened glass tiles with a solar panel and / or solar hot water inside. This is cheaper than tile + solar panels on top. A new thin solar panel called Sliver which is designed in South Australia and which uses 1/20th the amount of silicon compared to regular solar panels. It can be used on glass and looks like tinting. 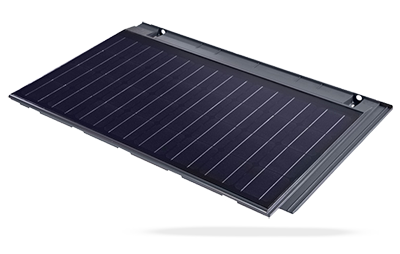 Solar can also be used to run roof ventilation and exterior lighting. Suggestions: Occasionally review new technologies that might suit your house or building and calculate the possible savings. A white roof can reduce the roof loft temperature by up to 10 degrees Celsius. Geothermal energy technology using hot dry rocks (HDR) has been piloted to produce steam at over 220 degrees Celsius by pumping water down 3-5 kilometres for heating and then under its own pressure back to the surface. Two or more bores have to be drilled. 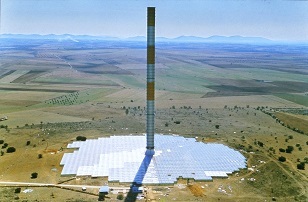 A small 1 MW thermal power plant based in South Australia is scheduled for completion in 2008. If this proves to be economically viable, then sources of base load power that is carbon neutral will be available 24 hours a day. A smaller variation on this theme is the geothermal 80 kW generator in Birdsville Australia. It uses naturally hot (98 degrees Celsius) groundwater which is run through a heat exchanger at 27 litres per second to boil and expand isopentane which runs the thermal generator. The groundwater is then used for the town's purposes. 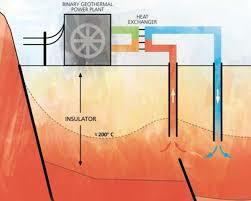 The largest geothermal energy from volcanic sources is in California at 750 MW using 350 wells in a 78 km2 area. Over 70 countries use this type of energy including Iceland, New Zealand, China and Hungary. This energy can be used for heating and the generation of electricity. A submersible pump that captures power produced by the action of waves of a floating buoy going up and down 1-2 metres. This creates pressure which is fed into a hydro style turbine on land. The first pilot of this system is in Fremantle, West Australia. It is estimated that a 1 metre high wave front can generate 20 kW per metre width. As most of the Australian population lives on or near the coast, the transmission losses to the load are minimal. An additional significant benefit is that the pressurised water can also be used for direct desalination using osmosis, without the electrical consumption of other desalination systems. One option that could be useful is to use the system for electrical generation during the day peak electrical load and then to produce desalinated water at night. Another system is to use the wave pitch with floating metal cylinders containing hydraulics and generators inside. These can be arranged in joined lengths with electrical connections from each cylinder fed back to land. Tidal power can be used for electrical generation by using submersible turbines connected to a structure fixed to the sea floor. A 1.2 MW version with two 16 m turbines with connected on a crossbeam is being used around the UK and Ireland. Suggestions: First perform an audit of the wave and tidal energy first by using meteorological information to predict ahead of time the likely generated output. 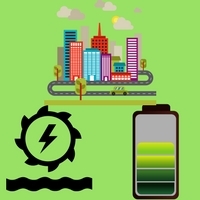 Some of the current disadvantages of battery technology include a recharging lifespan, slow charging, high weight and cost. A high voltage variation of a capacitor, an electronic component that holds a charge and is made from ceramics, may solve all the battery issues. The company EeStor is trying to develop a capacitor that can operate at 3500 volts with the energy stored being proportional to voltage squared. The end result would be a battery with 3 times the energy density of the current favourite lithium ion with a 5 minute charge time. Other uses of this type of battery are for remote solar power storage. These capacitors have a recharge cycle life that is measured in millions therefore you may never have to swap a battery again. Another possible use for this type of battery is to supply energy back into the grid at peak periods from near the load. 100 MWh of Tesla Powerpack batteries have been proposed for South Australia. 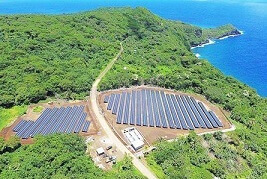 Samoa Island Tau also uses solar and batteries to replace diesel generators. Pumped Storage Hydro uses 2 water bodies and hydro-electric turbines to generate electricity on demand. Hawaii is using salt water pumped storage between a dam and the ocean. South Australia may do this also. 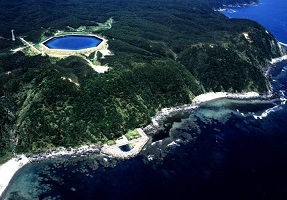 Queensland is using pumped storage between 2 ex open cut mines. Underground compressed air can be used as a form of energy storage for use on turbines. 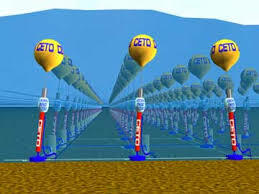 This type of energy generation works on the principle that hot air rises. Air has a 1 degree Celsius drop per 100 metres rise. The generator shape is similar to a large fairly flat upside down funnel. Solar energy hits the funnel and heats the air underneath. This air wants to rise and heads up towards the spout section were it meets wind turbines. The air then rises up the funnel. The principles are simple compared to the actual construction. A proposed 200 MW $800 M design for Mildura in Australia would require a 1 km tower and 5 kilometre diameter of heating area with 32 x 6.5 MW turbines adjacent to the tower. Wind speeds of 15 metres per second are expected. Heat collecting tubing underneath the collector could improve the power supply to 24 hours a day. A 50 MW prototype of this technology was built in Spain with a 600 foot tower, with an 800 foot diameter collection area. The main difficulty is in the creating a 1 km high structure. Perhaps when this civil engineering is mastered the price per tower will reduce. No water is required to run this technology. Suggestions: Perhaps having smaller versions of this technology available may make it more attractive.